The K Club has long enjoyed its position among the finest golf resorts in the whole of Ireland and in late 2006 it was catapulted into the worldwide golfing spotlight when the Ryder Cup came to town. Since then golf fans from all over the world have come to learn that it is one of the finest golf break destinations in the whole of Europe. With two stunning championship golf courses, five-star luxury and a fantastic location just a short drive from Dublin, The K Club is a must for any golfer embarking on an Irish golf break. For those who enjoy a challenge, the Ryder Cup Course has been tipped by many as the most difficult inland layout on the Emerald Isle. In late 2006, the Ryder Cup Course at the K Club became Ireland's first Ryder Cup venue, as it played host to Europe's record-equalling victory. It is a stadium-style resort course, and at over 7,300 yards from the tips, many commentators have described it as the most difficult inland layout in the country. Palmer has succeeded in manipulating the existing mature trees and water features to create a magnificent test for golfers of all standards. The coverage and attention that has been brought to both the K Club and Irish golf in general is richly deserved, given the faultless display that the Ryder Cup course exhibited during the Ryder Cup matches. The neighbouring Smurfit Course is an extravagant creation, divided from the Ryder Cup Course by the River Liffey, which flows right through to Dublin. The layout can be characterised as an inland links, with much earth having been moved to create dune-like mounds at the edge of the fairways. The drama of the experience at the Smurfit comes primarily from the 14 acres of water that have been worked into the course, making it pretty important to stock up on golf balls before the first tee. The course has a more rugged feel than its sister, owing to the planting of gorse and bracken. The signature hole is the monster par-5 seventh, which measures in at an astonishing 606 yards, and skirts a dramatic series of water cascades. In the Vintage Crop cocktail bar, the highlight is the humidor, which is a miniature version of the hotel itself and houses the best in Cuban cigars, from Montecristo to Cohiba. The 7th hole or 'The Swallow Quarry' provides a stern test for all golfers. At 606 yards, the hole is lengthy and a large water feature which runs along the fairway has been known to catch players out. The hole is one of the most dramatic in Europe, and as its name suggests, has the potential to wreck your scorecard within the blink of an eye. 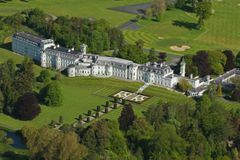 The experience at the K Club is genuinely 5-star from first to last, and as with the superb golf courses on the resort, the hotel's quality and luxury are unrivalled. The period features of the building itself are well-complemented by the first-class modern facilities inside the bedrooms and throughout the facilities. In fact, the K Club's hotel is so outstanding that it has been named Ireland's only 5 Red Star venue by the AA, and has been awarded the RAC Gold Ribbon. The surroundings are equally spectacular, as the hotel is set amidst 800 acres of stunning woodland. Since its conversion to a hotel in 1991, this former country home has consistently developed its product, and is now a complete package. The superb dining options, and first-class leisure and spa facilities round off what is one of the premier golf break destinations in the UK and Ireland. Visitors to the K Club can sample the possibilities afforded by the estate and its surroundings, including excellent fly-fishing, horse riding, clay pigeon shooting, walking, and cycling. Meanwhile, the on-site K Spa prides itself on offering the very best in health and beauty treatments. The complex also features a 16-metre swimming pool, water jet massage, Jacuzzi, sauna and steam room, while the doors open out to a ‘Zen Garden', where you can let all your troubles slide away. The Byerley Turk is a sumptuous dining room, offering the finest in French cuisine. There are superb bars in which to drink, including the Hotel Bar of the Year, the Vintage Crop, named after Dr. Michael Smurfit's superb horse which became the first horse to surpass £1million in earnings. we had a really nice stay at the hotel. The rooms were clean and comfortable. The location is also really nice, close to the airport. The hotel at the K Club and the Palmer Course were an absolute dream and the staff at both the golf courses, as well as the hotel were excellent - full marks there! Unfortunately the Smurfit Course wasn’t really fit to play golf on due to the heavy rain and muddy conditions and whilst the greens were really good considering, the fairways in places were like a bog. We appreciate the resort cannot control the conditions but we couldn’t figure why 2 courses on the same patch of land were in such stark contrast when it came to overall condition. It did not detract from our enjoyment however. As I said, the staff could not have done more for us throughout our stay, and even gave us a complimentary 9 holes on the Palmer for a 21st birthday present, with a gift box with a ball marker and pitch mark repairer thrown in too. You simply cannot fault the people, the location, the spectacular setting and the overall experience in any way! Our time spent at The K Club recently was really fantastic. It's a fabulous hotel not only for the setting which is amazing, but the friendliness of the hotel staff, quality of food and service as well. It was all outstanding. I thought both golf courses were in excellent condition and beautifully maintained. The Palmer Course was my favourite but that said, there's not much to choose between them as they both offer the golfer a tough challenge! We all said we would definitely return but with more friends as we had such a fantastic time. I must compliment Your Golf Travel as well on your outstanding service and efficiency. You made it very easy for us all so thank you. I would highly recommend both YourGolfTravel and the K Club for your next golf trip. The service from YGT was excellent and the hospitality and service in the K Club was outstanding. I'm a veteran of these types of golf trips and this was undoubtedly one of the best ever. Both golf courses at the K Club are challenging and interesting to play and the 'craic' in the 19th afterwards was legendary. Just a short message to say thank you to Your Golf Travel for organising our golf trip to The K Club; both of the golf courses were top class and in great condition, especially considering the time of year we visited. Full credit must go to the green keeping staff for this. The apartments are ideal for groups of golfers sharing and are of a very high standard. I’ll be recommending both The K Club and yourselves to my golfing friends and hopefully it won’t be too long before I’ll be in touch with you again myself. We had a great time away at the K Club. Both golf courses were brilliant and very enjoyable for all levels of golfer. We had two 20 handicappers and while the courses were both really tough tests of golf, they enjoyed it immensely. Both courses were both in terrific condition with particularly good greens. They were immaculate. The clubhouse was pretty quiet which was a bit of a shame and pints were quite expensive but you have to expect that in a 5 star hotel. The free one went down a treat though! We ate in the new K-Thai restaurant which was super, with the staff members and the food being top class. The prices in here were fairly reasonable to so I’d definitely recommend it. Overall we were very pleased with our trip and while prices were fairly high while at the resort, the overall value for money of the trip itself we thought was excellent. Overall I would rate the trip a good solid 8.5 out of 10. The golf courses for me were even more impressive than carton house, but the overall package of carton house still just edges it for me. Visiting the K club was one of the best golfing experiences we've ever had. On arrival to the grounds of the hotel and the surrounding golf courses, we knew we were entering 5* territory...luxury at its best! From arrival to main reception within the hotel, as well as both club houses, the warm, friendly and courteous manner from everyone was evident to see. We were made to feel at ease and it was as if we were at our own home club. Both golf courses are outstanding with plenty of thought and precise shots required due to clever use of natural water features and perfectly placed bunkers. There’s no grip it and rip it on these courses! I would have to say the Palmer Ryder course is the best course I have ever played, with beautiful fairways and really true greens, even at this time of the year. One of the most beautiful holes is the par 5 16th which runs along the river Liffey. To reach the green a shot must be played across the river to a green raised up high and it’s truly stunning. Pure excitement no matter your ability. Overall the K Club is a wonderful place to stay and play with quality in abundance everywhere you turn. And when you think of all the professionals who have walked the very same fairways before you, it makes the whole experience a privilege. I have no hesitation in saying the K club was the best golf resort I have played at and 10 out of 10 for accommodation, food, golf, and the sheer ambience of the place. We’ll definitely be returning. Thanks to YGT for your efficiency and professionalism when dealing with our request; I shall definitely be using you guys again. Course a little bit tired in places probably due to high summer traffic. Wonderfully scenic however and the 16th is a joy (once the old Victorian bridge is repaired it will be back to its full former glory. The course is well worth it but might need some tender care this winter to be back to its full glory. Great to play a Ryder Cup course but after playing the others on the coast was hard to comapare. Course had plenty of water challenges but did not have many real stand out holes. A little disappointing. Une of the most beautiful clubs I’ve ever seen. Fantastic championship course that is really a fun time. With all the history there you cannot help but love it. One of the best courses I have played. Same goes for my colleges that played with me. I definitely want to come again to play this course. The Smurfit course was in a good shape. The course has a nice layout, with some really memorable holes. A nice experience. I would not pay full standard greenfee (it isn´t that good) But as a deal with YGT it works. Actually better layout (wider , less trees) than the Ryder cup course. A nice experience. I would not pay full standard greenfee (it isn´t that good) But as a deal with YGT it works.